We are one of southern Alberta’s leading civil survey companies. For over 30 years we have served the surveying, design and drafting needs of many public and private clients. For a look at some of the projects we have been involved in over the years check out our Services. 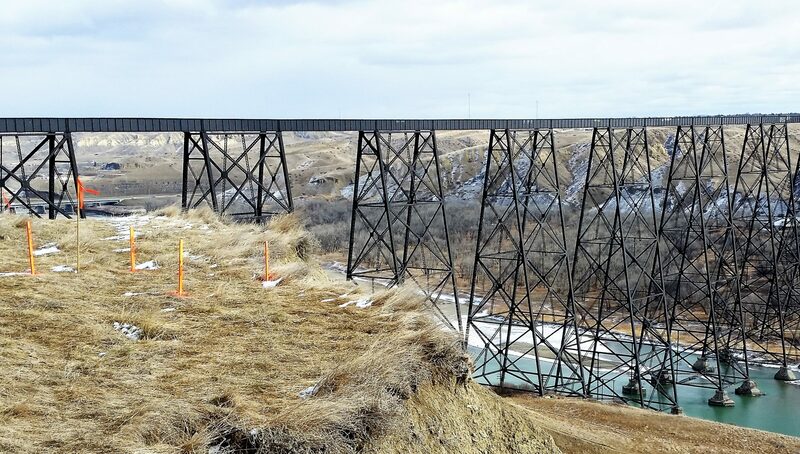 We currently service all areas south of Calgary from BC to the Saskatchewan borders, as well as southwestern parts of BC and occasionally we travel into Saskatchewan. Ask us about your project, nowhere is too far to go. We currently staff 6 Certified Survey Technologists (CST) certified through the Alberta Society of Surveying and Mapping Technologies (ASSMT), 2 Survey Assistants and 3 Design and Drafting Technologists. All our employees are highly educated and are ready to put that knowledge to work for you. We are much more than just a survey company. We offer small project design and drafting, Architectural Design Controls and leading-edge geomatic solutions. Whether it’s new building construction, the development of a new rail line, mapping out a new roadway or working on some of the biggest infrastructure projects in Southern Alberta our surveyors offer the highest level of client care and responsiveness. We offer our clients technical expertise and superior results to meet their projects special needs. WE TAKE CARE OF ALL YOUR SURVEY NEEDS!